The New York Post reports that Current TV’s left-wing employees, in the aftermath of the network’s sale to the Saracens, are not too happy with their former boss. Just call him Al Gorezeera. Yesterday morning, the still shell shocked staff at Current TV was called to an all hands staff meeting at its San Francisco headquarters, which was teleconferenced to their offices in LA and NYC, to meet their new bosses. That would be two of Al Jazeera’s top guys: Ehab Al Shihabi, executive director of international operations, and Muftah AlSuwaidan, general manager of the London bureau. Ominously missing was the creator of Current, the self proclaimed inventor of the Internet and savior of clean energy, Al Gore, although his partner, Joel Hyatt, stood proudly with the Al Jazeera honchos. “Of course Al didn’t show up,” said one high placed Current staffer. “He has no credibility. The meeting, while not contentious, was, according to staffers who spoke on the condition of anonymity, miserable. 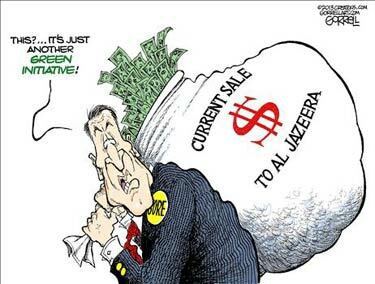 The mostly left-leaning group—some still in denial —weren’t buying what Al Jazeera was selling. The “new” American Al Jazeera will, according to Shihabi, appeal to the American audience with a mixture of national and international news—and, of course, entertainment. But you won’t be getting that Middle East merriment until April, which is when the network says it will be ready to take over. “Sometime within three months—no more, no less—we were told,” said the Current staffer. One person at the meeting, who has already announced that she’s leaving, former Michigan Gov. Jennifer Granholm, tried to ask about severance packages for those who wouldn’t be staying. “This isn’t the place to discuss this!” Hyatt barked at her. “After that, everyone kept their questions pretty much to themselves,” according to the staff member. How do they feel about Gore the savior of green energy now? The displeasure with Gore among the staff was thick enough to cut with a scimitar. “We all know now that Al Gore is nothing but a bulls***ter,” said the staffer bluntly. Dan Greenfield really puts Albert Gore’s career into perspective. The Gore lost the election, went into the wilderness of Belle Meade and came out with the revelation that it’s time to drop all the little lies and stick to one big one. Forget claiming that you invented the comma and the cocoa bean while on a conference call with Isaac Newton and just focus on warning everyone that the planet is about to explode. A lie as big as a planet. A lie that was too big to fail. 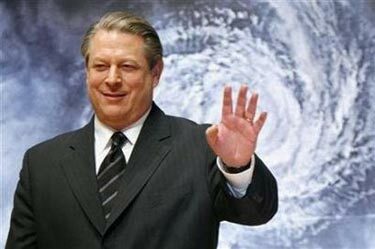 Gore monetized that lie, he took it to every bank on the planet and then he took it to every cable company and convinced them to give him access to 40 million American homes so that he could tell them that the planet was about to blow up. And just as he had at the White House, Al Gore cashed out that access and sold it to an enemy nation. There are idealists who sell out and become hollow men, and there are hollow men who pretend to be idealists. Gore is a hollow man selling someone else’s alarmist hollow earth theory so he can make it to the next stage of a career that has no meaning or purpose. Like most professional idealists, Al Gore cares for nothing except money. Having sold out so many times, his only idea is to keep doing it again and again. The professional idealist is a hollow man. A soulless man who is tasked with convincing everyone of the existence of the thing that he does not have. The left has created an endless number of professional openings for such soulless men, for paid liars and faithless tricksters, who live only to convince the world that they believe just long enough for them to sell out one more time. And then there’s former one-heart-beat-from-the-Presidency Al Gore, America’s Caligula. Having obtained the second most ridiculous Nobel Peace Prize in history and a hundred million dollars or so for using junk science and shameless demagogy to erect a rationale for governmental parasitism on the productive economy on an unprecedented scale, Al Gore jets off, spewing carbon emissions profusely all the way, to use his high-level political clout to secure cable distribution for a new “progressive” television network. Current TV was supposed to become the American left’s great new weapons platform, allowing them to compete successfully for public influence with conservative AM talk radio (Rush Limbaugh) and Fox News. The problem is that Americans weren’t interested in left-wing propaganda, and Current TV’s rating numbers compared with those obtained by late night test screens. But was polú-tropos* Al Gore discouraged? Not he. He simply turned around and sold the network he developed to subvert America via domestic treason to a foreign enemy. His share? Another hundred million. Now Americans will be able to tune into a televised equivalent of Tokyo Rose right in the middle of their cable programming list. Jeff Schultz, of the Atlanta-Constitution, reports that interest in the Falcons-Saints game was found coming from one surprising direction… from the direction of Mecca, one is inclined to suggest. Which leads me to the Falcons-Saints game. (Attention, aspiring journalists: Transitions are for wimps.) The teams meet Monday night in the first game in the Superdome since Hurricane Katrina. the Archives of Never Yet Melted in the 'Al Jazeera' Category.